”As one of the Nordic region’s leading trading groups, Axel Johnson aims to meet with customers across all contact channels and develop new digital offers. The ambition is to create digital entrepreneurs and increase the number of business development initiatives that make use of the trading group’s digital resources. Our collaboration with RECAPEX will boost our acceleration further.” - Johan Fant, CFO at Axel Johnson AB. "At Ekstranda we want to back great entrepreneurs and great ideas. With the existing funding gap between early stage ventures and the investor community, working with a team like RECAPEX we can help bridging from the necessary research, to providing the appropriate capital and then adding world class execution." 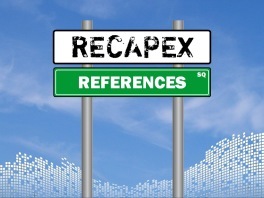 RECAPEX helps large, ambitious companies to become more successful by leveraging the digital revoultion. In tandem, we also help ambitious digital entrepreneurs to realise sustainable growth to become large, successful companies.